"An authentic recipe for Mexican-style beans. Serve moist and hot with your meal, cover with grated Mexican cheese and accompanied by pickled jalapeno peppers." Combine water, pinto beans, and garlic into a large pot and cover; Cook over low heat for 5 1/2 hours; stir salt into beans and continue cooking until beans are very soft, about 30 minutes more. Heat canola oil in a skillet over high heat. Spoon the beans into the skillet without draining excess water; mash beans using a potato masher until they begin to lose their shape, about 3 minutes. Add water if needed during the cook time to ensure that the beans remain covered. 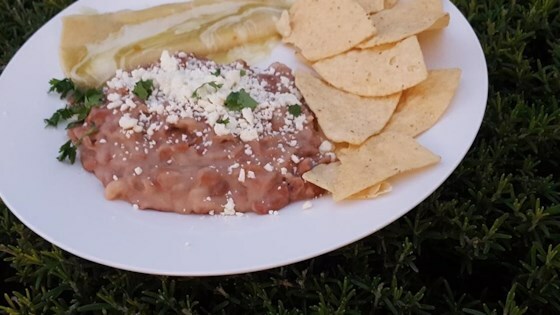 Easy and tastes just like beans from a Mexican restaurant. Kids love it too! Yes I used dry beans and bacon instead of salt pork. I also used fresh garlic it was delish. Used bacon grease in place of the oil, added fine diced onion and jalapeno to the refry. Good beans.